From 6th to 7th December 2017, at Beausejour Hotel, in Kigali, the Rwanda Natcom (CNRU) in collaboration with Uganda and German Natcoms, organized a training workshop on UNESCO Biosphere Reserves and UNESCO Global Geoparks in Eastern Africa. The workshop was officially opened by Dr Marie Christine Gasingirwa, the Director General for Research, Sciences and Technology in the Ministry of Education and Vice Chairperson of Rwanda Natcom and has been attended by about 20 participants, including delegates from EA Natcoms; Kenya, Tanzania and Uganda. Participants are Secretary Generals of Natcoms and senior programme specialists, mainly these who are managing the MAB Programme in their respective Natcoms and/or institutions partners. 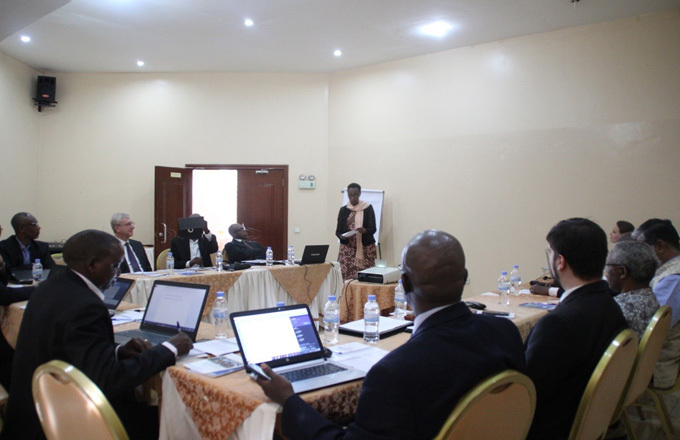 Rwanda Natcom, as the host institution, has been granted with more participants to the workshop. Three high profile experts from Germany Natcom were present to the workshop and have made presentations on the 2 main topics, have facilitated the working groups and shared knowledge and experiences with participants. The Germany Natcom has provided all financial and logistic support to the workshop facilities. What is the background of the EA Natcoms capacity building programme? In accordance of the UNESCO Constitution and the Charter of National Commissions for UNESCO adopted by the General Conference in 1978, National Commissions (NatComs) have mandate to participate in the elaboration, implementation and evaluation of UNESCO’s programme. NatComs should advise both their governments and national partners on issues related to UNESCO, facilitate cooperation between UNESCO, public agencies and relevant national umbrella associations and scientific institutions, disseminate information on UNESCO activities to the public, and implement the various programmes and projects of UNESCO in their country. In the framework of strengthening the North-South and South-South collaboration between UNESCO Natcoms, a human resources capacity building joint project have been developed with the technical and financial support of the Germany NatCom (DUK) and UNESCO, to improve the quality and impact of UNESCO services in general. The first phase of the capacity building programme started with a workshop held in Kigali in 2009. The current and second phase of the project is a result from a way forward consultation through EA Natcoms on common needs and challenges. It focus mostly on enhancing the professional skills and technical competency of program specialists and others general services staff. This EA Natcoms staff training was extended to CNRU partners in specific scientific knowledge and technical skills of the Man and Biosphere (MAB) Programme of UNESCO to enhance technical skills in developing and promoting UNESCO Biosphere Reserves and UNESCO Geoparks. .
What are the Rwanda interests in the MAB programme and the current training? 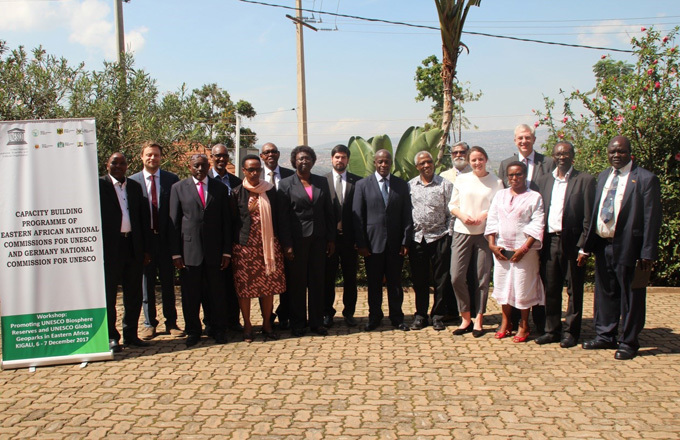 Rwanda is an active member of UNESCO/MAB programme through the AfriMAB and World Biosphere Reserves Networks (WBRN), since 1983 when the Volcanoes National Park was nominated as a Biosphere Reserve. In May 2017, the Government of Rwanda conducted and submitted the periodic review report for the Volcanoes Biosphere Reserve and National Park. And nowadays Rwanda is in process to conduct and submit the report for the nomination of Gishwati-Mukura new National Park as a biosphere Reserve. The last 5th AFRIMAB General Assembly held in September 2017, recommended to the East Africa Cluster to work on a common and joint project for the East Africa Region, focusing to the capacity building towards the improvement of the governance of MAB programme and Biosphere Reserves in Africa. In that context the workshop was initiated and organized with the main topic and objective to promote UNESCO Biosphere Reserves and UNESCO Global Geoparks (in particular transboundary initiatives) in the five countries of East Africa. So far, UNESCO Biosphere Reserves (BRs) are already quite well established in East Africa with 6 in Kenya, 4 in Tanzania, 2 in Uganda and 1 in Rwanda. Some of them have even made successful efforts by conducting periodic reviews reports which were submitted this year to MAB ICC in the context of the “Exist Strategy” of the MAB programme. These applications have contributed significantly in the improving BRs governance; resonation and extension based on valuable stakeholders consultations. The workshop has showed that the initiative of UNESCO Global Geopark, as for UNESCO BRs, is based to a holistic concept of protection, education and sustainable development of sites and landscapes with international geological significance and impact. At present, there are 127 UNESCO Global Geoparks in 35 countries, with only one in Africa, at Morocco. However, we have discovered many potential Geoparks sites in East Africa and some good proposals have already been prepared and almost ready to be submitted to UNESCO for nomination. What have been the main results and recommendations of this workshop? This workshop has clarified the understanding of the two concepts, the differences and the parallels between the Biosphere Reserves and Geoparks, with a focus on the added value for local communities, sustainable development and peace in both cases. The participants have improved their understanding of the current progress of Biosphere Reserves concept and the MAB Programme in general, in terms of the Lima Action Plan and the “Exit Strategy”. Regarding the Geoparks new initiative, the workshop helped in empowering East African NATCOMs professionals by upgrading their knowledge and skills on why and how to establish Geoparks in the region and in the identification of potential transboundary Geoparks in East Africa and all relevant stakeholders in their respective countries. As the main outcomes of the workshop, a join action plan of East African Natcoms has been formulated and a regional project to be submitted by the whole cluster to UNESCO PP has been identified and agreed on. The joint project will be focusing on a proposal of Lake Victoria Geopark and will be leaded by Uganda Natcom. It was also recommended to each East Africa Natcom to formulate and submit an application related to MAB programme at national level of UNESCO PP selection. A first tentative of proposals has been made by Natcoms delegates present to the workshop.